lovelydiggs | For Lovers of Interior Design , Art and all things lovely…. Dottie Eaton is an Interior Designer/Photo Stylist/Artist based in St. Louis Mo. Her company is called Design Style and focuses on creating unique interiors for residential, commercial and photo styling interiors for magazines and catalogs. 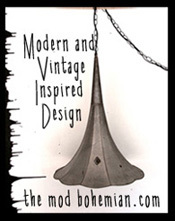 "Here I write about some inspiring finds to help you create some truly lovely diggs.................."
the mod bohemian online design boutique – Alive and Kickin!